Unlike Spotify, Tencent Music is highly profitable and has exclusive licensing deals with top music labels. It also has some other big advantages. Tencent Music claims the four most popular music apps in China all by itself. Though China's Tencent Music has naturally drawn comparisons to Spotify (SPOT , which has a large presence in Europe, North America and Latin America, there are some pretty big differences between the two online music platforms. 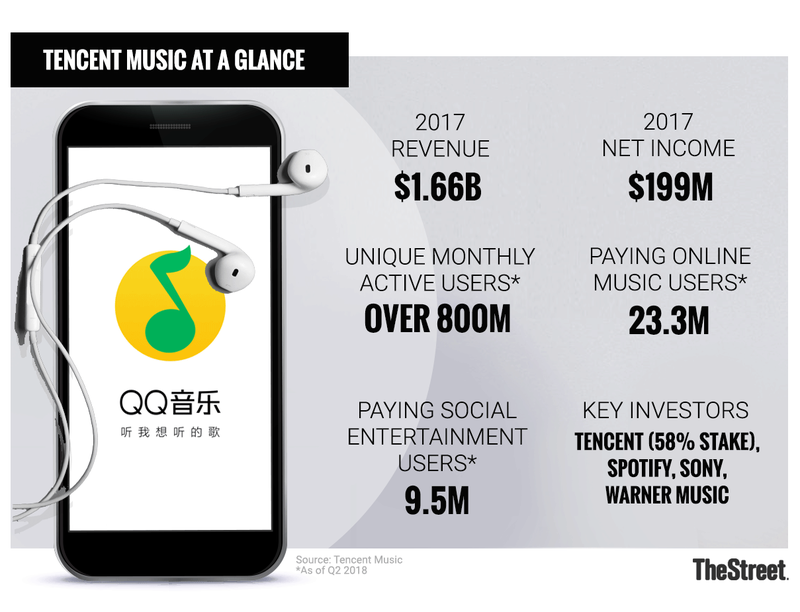 And in many ways, the differences reflect favorably on Tencent Music -- perhaps enough so to ultimately give the company a post-IPO valuation that's above Spotify's current $32 billion market cap. On Tuesday, Tencent Music, which is 58%-owned by tech giant Tencent (TCEHY , became the latest in a string of Chinese tech firms to file for a U.S. IPO this year. The company plans to list under the symbol TME, and is reportedly aiming for a valuation of $29 billion to $31 billion. In one obvious respect, Spotify's story is stronger than Tencent Music's: Whereas Tencent Music is focused on China, Spotify is targeting nearly every major internet market except for China, where its exposure largely consists of a 9% stake in Tencent Music. Revenue-wise, even after accounting for some differences in their business models, that spells a larger long-term addressable market. Spotify has narrowed its losses some and -- thanks to the fact that it tends to collect subscription revenue before it has to pay the related licensing fees -- is now producing a small amount of free cash flow (FCF). However, the company still reported a €131 million ($151 million) operating loss for the first six months of 2018 on revenue of €2.41 billion ($2.78 billion), and expects to report additional losses for Q3 and Q4. By contrast, in its IPO filing, Tencent Music reported an RMB1.95 billion ($294 million) operating profit for the first half of 2018 on revenue of RMB8.62 billion ($1.3 billion), which is up 92% from the same period a year ago. And met income rose over four-fold to $263 million. One reason for this difference: Tencent Music's deals with top music labels, many of which had struggled until recently to produce significant digital music revenue in China due to piracy, appear to be more favorable than Spotify's deals. Whereas Spotify's gross margin is currently in the mid-20s, Tencent Music had a 40.4% gross margin during the first half of 2018. In addition, Tencent Music's operating expenses -- though up substantially on an annual basis -- amounted to only 19% of its revenue during this time period. For Spotify, they equaled 31% of revenue, due to substantial marketing and R&D expenses. Spotify currently gets about 90% of its revenue from music service subscriptions, and the remainder from ad-supported music streaming. Tencent Music, on the other hand, only gets about 30% of its revenue from "online music services." This revenue is said to "primarily" consist of music subscriptions that start at just RMB8 ($1.21) per month, but also covers things such as digital downloads, ad-supported music services and the sub-licensing of music to other content providers. Much of the other 70% of Tencent Music's revenue, which are recorded in the "social entertainment services and others" line of its income statement, comes from "virtual gift" purchases related to its popular live-streaming and online karaoke services. The company also gets some revenue from selling "premium memberships" related to these services -- they provide things such as higher quality audio and singing tutorial video clips -- as well as by selling hardware such as speakers, headsets and microphones. Notably, though they account for a solid majority of its revenue, Tencent's social entertainment services claimed only 9.5 million paying users (defined as the average number of paying users in a month) for Q2, compared with 23.3 million paying users for its online music services (defined as the average number of users whose subscriptions were active at quarter's end). As a result, its average revenue per paid user (ARPPU) for social entertainment services was nearly 13 times its ARPU for online music services. While the 83 million subs that Spotify claimed as of June make it the world's biggest music subscription platform, Apple's (AAPL - Get Report) Apple Music, which had over 50 million subs as of May, has emerged as a strong No. 2 player. Spotify also has to contend with services such as Alphabet's (GOOGL - Get Report) YouTube Premium, Amazon.com's (AMZN - Get Report) Music Unlimited, Pandora Premium and Tidal, each of which can offer nearly all of the most popular acts currently on Spotify. Tencent Music faces far more limited competition, thanks in large part to the fact that it has exclusive Chinese licensing deals with Big 3 labels Universal, Warner and Sony. While Tencent Music has agreed to sub-license some of its content to music services backed by the likes of Alibaba (BABA - Get Report) and NetEase (NTES - Get Report) , and there is a risk that regulators could one day pressure the company to sub-license more content, its exclusive deals currently translate into a major competitive advantage. Those deals are a major reason why Tencent Music lays claim to China's four most popular music apps. The company reports having a whopping 644 million mobile monthly active users (MAUs) for its online music services, and another 228 million mobile MAUs for its social entertainment services. With only a small fraction of these MAUs currently counted as paying users, and many of those who are paying carrying a low ARPU, Tencent Music appears to still have a lot of room to grow. Though Spotify has some partnerships with big-name tech companies -- its alliance with Facebook (FB - Get Report) is certainly of note -- it's also competing head-on against three U.S. tech giants. Each of these tech giants can offer most of the same music content that Spotify does, while keeping their marketing costs down by promoting music services to their large user bases and potentially using other services (YouTube, Amazon Prime, etc.) to bundle additional content and/or subsidize the cost of their music services. As its name and shareholder base makes clear, Tencent Music can count on the close support of one of China's two biggest tech companies. While this confers a variety of benefits, perhaps none is larger than the integration of Tencent Music's services with Tencent's WeChat mobile platform and older QQ social platform. As of Q2, Tencent claimed 1.06 billion MAUs for WeChat and 803 million MAUs for QQ. In its IPO filing, Tencent Music notes that most activities taking place on its WeSing online karaoke app take place between users already connected via WeChat or QQ. It also notes that a user who listens to a song on its QQ Music app "frequently sings the same song on WeSing and then shares the performance with friends on [WeChat] or QQ, which in turn attracts their friends to download the WeSing app." Users also have the option to register for Tencent Music's services via WeChat or QQ accounts. The synergies highlight how Tencent can use its massive platforms to enhance the value of the many tech companies it has large stakes in. As just one example, on Wednesday, Tencent disclosed it's taking a $318 million (12.3%) stake in Chinese video-sharing site Bilibili (BILI . Apple, Alphabet, Amazon.com and Facebook are holdings in Jim Cramer's Action Alerts PLUS member club. Want to be alerted before Jim Cramer buys or sells AAPL, GOOGL, AMZN or FB? Learn more now.